Residential buildings constantly evolve and so do some materials that are used to construct them. When you're faced with the dilemma of choosing whether to remodel an old home or find a good prefabricated house, your choice would ultimately affect you and your family in the long run. However, there is another option that's quite convenient and possibly temporary. Go for a mobile home. In a nutshell, a mobile home is the product of people who do not want to build or rebuild a house just yet. 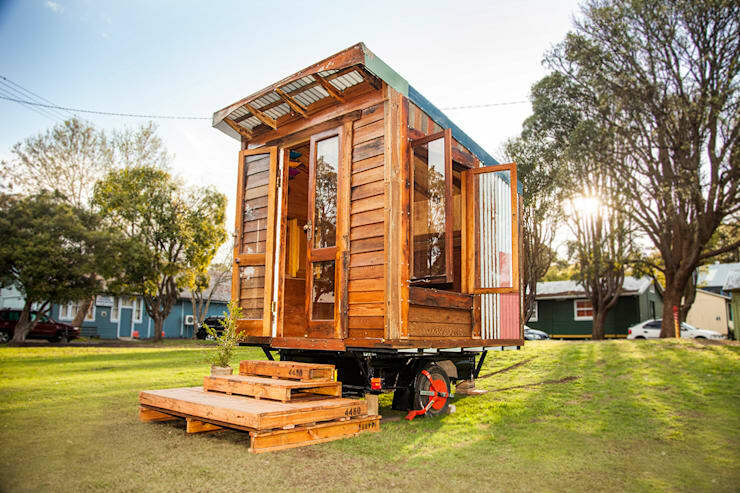 Built usually out of wood and steel, the mobile home comes with wheels attached to it and may include stoppers to remain stationary at a location. Some models can be connected to a motor vehicle like a van or an eight-wheeler truck for easy transport. 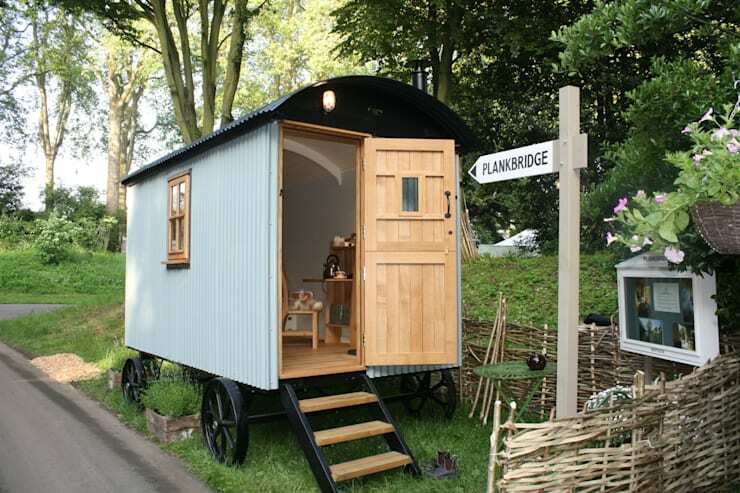 Check out these eight mobile homes and you might just decide to have them for a longer term. This compact, wooden-type box might remind you of those childhood treehouses, but it's got so much more to it than that. Constructed with natural materials, this mobile home is equipped with a stow-away table and a bed that also works as a couch. It's also got convenient wall shelves that can be folded back against the wall to have more space inside. Other than those essentials, the savvy residential wagon embodies that youthful and adventurous vibe through its wood, iron sheet, and glass materials plus interior furnishings. 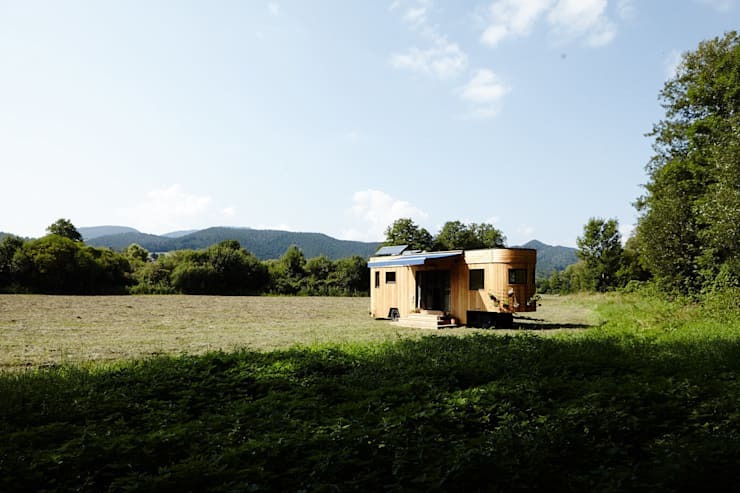 From its front, this mobile home looks like a portable comfort room in the middle of nowhere. 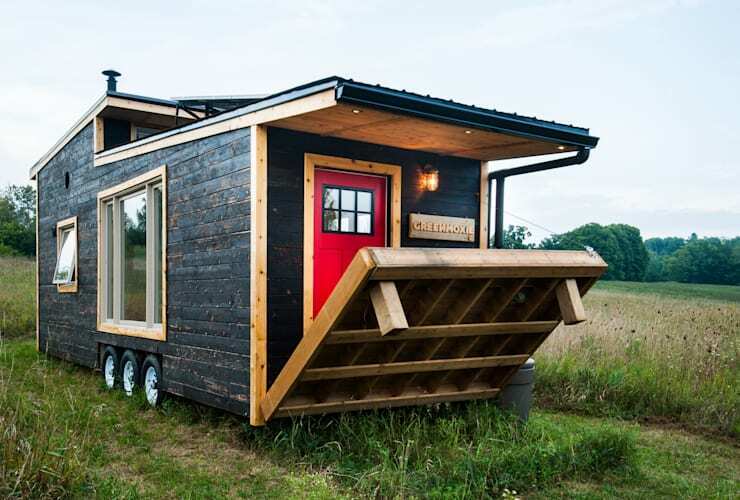 A small stretch to your side would reveal that it is a rectangular, matchbox-looking home on wheels. Its black color on wood with outlines showing raw wood detail how natural materials can be styled to pull-off laid-back homey exterior. The red door is a stunning choice to contrast the neutral palette of the surface. So it doesn't come as a surprise that, aside from securing the home, this foldable porch conceals the attractive red entrance. 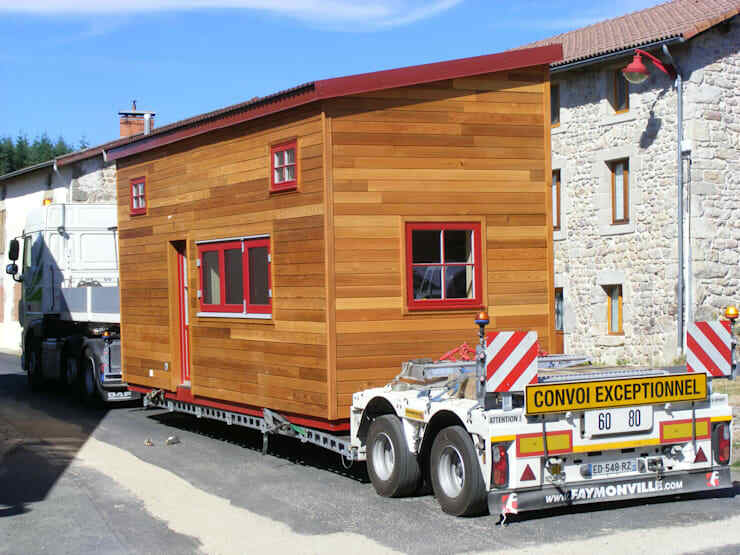 If it weren't for the 12 wheels carrying this house, we would've dismissed it right away a mere compact house standing firm on solid ground. If you're a sucker for traditional, gable-roofed houses, then here's one that might entice you. Furnished with that classy wooden luster against dark green details, this mobile home's wooden cladding reminds us of cozy countryside homes. Its gable roof includes gutters and downspouts ready to drain away rain water. The modern glass doors and windows, on the other hand, also sport stylish shutters on their sides. 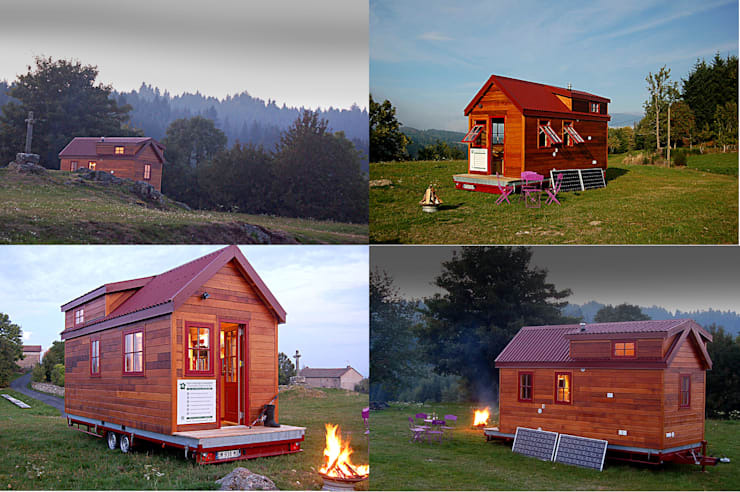 This compact mobile home is made up of wooden cladding overlayed by corrugated galvanized metal sheets. Its pastel exterior nicely complements its sandy-light wooden plus white-coated interior. 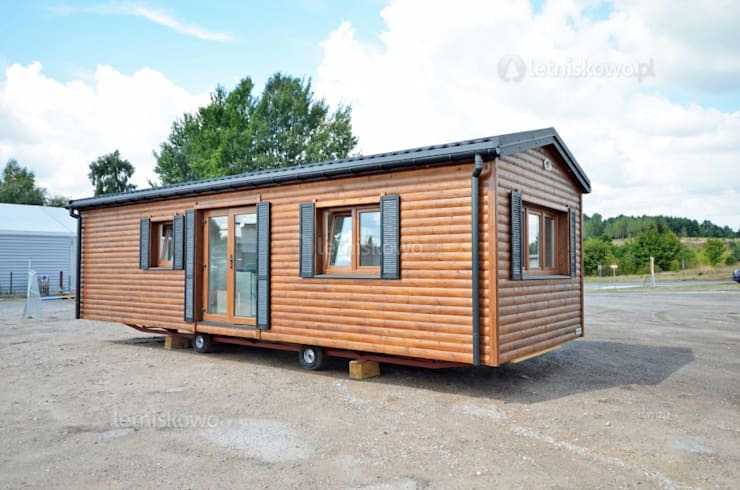 The curved roof plus the dainty window make this structure ideal not just as a mobile home but as a commercial tiny box that could be selling trinkets, baked treats, hand-made crafts, and other interesting items. Its mobile character is also reminiscent of those travelling merchants in the past. Imagine how attractive your business will be once you park at some neighborhood, the plaza, or in some festival! This one caught our eyes because of its interesting revamp of the gable roof design. It amusingly looks like it contains a tiny attic inside. The red against an assorted mahogany cladding also recalls a toy store, possibly attracting your kids to stay here and widen their imagination. Of course, its design has practical functions like the roof can be installed with solar panels, the windows can be opened to allow more air to come inside, and the same windows also let natural light in. All of which generally utilize the natural environment to provide energy inside as opposed to relying on non-renewable sources. 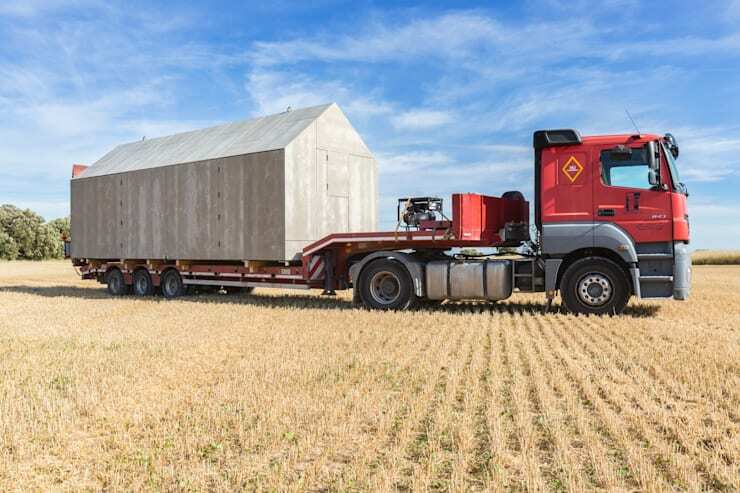 Transport your house with the help of an eight to ten-wheeler truck! That's possible through this prefabricated home built mostly on sturdy wood.The side material continues all the way to the roof giving it a minimalist appeal. While the exterior features an industrial gray color to it, the interior will wow you with its simple yet sophisticated furnishings. Anyone plowing these fields will definitely be surprised once they enter such an unassuming structure. This slender home is characterized by its wooden cladding and unique curved edges. The structural beams and the flat roof were also made out of wood. To harness the sun's energy, solar panels can be mounted on top of it. The design can remind one of those trailer park homes and it's also especially fashioned like it's fresh from the 90s! The red and vibrant brown combo comes alive in this side-part-style home with a slightly pitched skillion roof. An adorable set of windows decorate the front which actually reveal a second floor inside. Who would think that this includes a second level, right? Apparently it does and it's just ideal for a bed space that's easily convertible into an extended living area. The lower level is composed of a compact kitchen and sitting area. The interior echoes the exterior's fine wood work so a homey atmosphere is definitely achieved. Do have a look at these 10 small houses that can fit in your garden too!